I know this topic was discussed before but haven’t found a clear answer. So I finished my tabletop with mineral oil and it’s not giving enough sealing for daily use. I want to strip off the oil finish and apply Arm R Seal. I started with sanding with 120 grit but the oil never go away and the sandpaper gets clogged with wet dust so quickly. I did some research and now am using mineral spirits. A couple questions here. - do I leave mineral spirits on the wood until it dries or should I wipe it off at some point? How long do I need to leave it to be soaked? - should I use a different material? Some suggested laquer thinner but I wasn’t sure if it works for mineral oil. Looking forward to some advice here. I would work on it every day. Wipe it down and coat with blonde shellac. Shellac won’t care about some oil on the surface. Then topcoat with whatever you want. You might be able to use oil base varnish directly, not sure. While you right that MO is not considered a drying oil, I think is probably more accurate to say it not a hardening oil. It stays in a liquid state in the wood rather than hardening. It will evaporate over time though there may always be remnants of oil in the wood. You may be able to speed up some of the evaporation with warm airflow but it will take some time. Rick’s suggestion of shellac after using mineral spirits is a good one as it is generally considered the universal primer. I would definitely experiment with some scraps of the same wood or the underside of the table first to make sure that whatever finish you use will adhere and stand up over time. Acetone works quite well on oily finishes also. It will pull the oil out of the wood. I have used it for many years to wipe down oily woods prior to glue up and applying finishes to the same oily woods. Thanks for all your input. mineral spirits didn’t seem to work great so I tried denatured alcohol and it seems better. Hardware store guy told me oil based poly should work fine over oil finish….I am getting more confused. 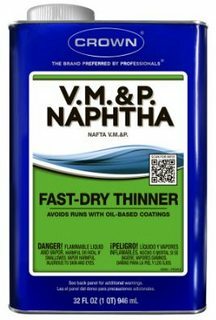 I switched to Naptha some time ago, cleans well, dry’s fast and leaves no residue. You’ve been given extremely good advice. Spend the extra $20 for some rattle can shellac and spray a few coats after using whatever solvent to get as much mineral oil out. Keep the can 8” away and keep it moving. Top with whatever finish you desire. Don’t listen to the hardware store guy. Oil based Poly will work over an oil finish (or water based finish for that matter) that completely dries or hardens. It won’t stick or cure if the oil is still wet which is the case with mineral oil. Thanks for the additional comments. After cleaning the tabletop with denatured alcohol 4 times, it is not like the bare wood but it looks dry. I will clean it for few more times and apply a few coats of shellac spray can as everyone here is suggesting before applying Arm-R-Seal. Hopefully the finish won’t peal off. I switched to Naptha some time ago, cleans well, dry s fast and leaves no residue. Jim and Andy, I’ve got a question for you about naptha. I picked up a piece of cut off from black walnut table top. Several strips of black walnut glued on edge. They used butcher block oil on it. I had thought, when I got around to it I’d use acetone. Would you two suggest naptha instead? What if any, are the benefits of it over acetone? I’ve been using acetone as a cleaner for quite some time. I’m just curious about naptha as I have no experience with it. I’ve used denatured alcohol as a cleaner for years….cleans great and leaves zero residue that I can tell. Helps remove oily things and takes glass to a bare state. Is naptha the denatured alcohol superior?? Skim, do you find a solution? I have the exact same question about refinishing a butcher block that has a mineral oil finish. I have sent a message to General Finishes asking if Seal-a-Cell and/or Arm-R-Seal will work after I have sanded down and cleaned with mineral spirits. Did you have any luck? Did you talk to the guys at Rockler in Novi? I am in Troy so I might head over to Woodcraft and see if they have any advice. I keep mineral spirits, Naphtha, denatured alcohol and acetone in the shop for different things. Naphtha often times dries to fast and I will use the mineral spirits.